An enchanting ambience and a repertoire of royal favourites that encourages the art of dining, where food is heartily shared, and conversations are never ending and where every meal becomes an occasion. At Hyatt Regency Gurgaon, we have multiple dining options. Come and enjoy the unique culinary experience. The Lounge- Conversations over coffee. 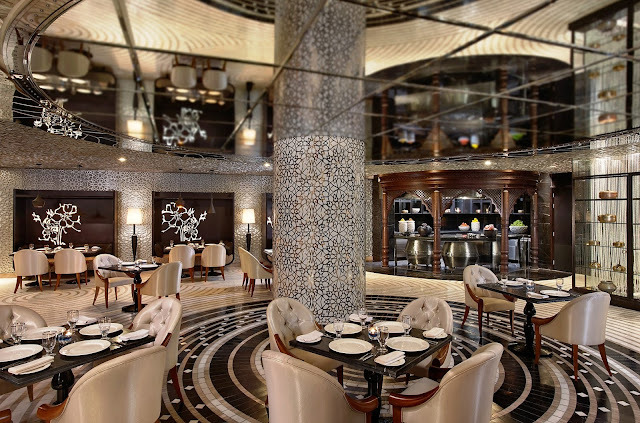 The relaxed setting makes it the perfect place for an after work rendezvous. The Lounge has a seating capacity of up to 65 people. Situated at the lobby level, it serves a grab-and-go food in a relaxed and cosy atmosphere. It offers an eclectic selection of appetising tapas and a patisserie counter with delectable pastries and a wide variety of premium teas and coffees. At Kitchen District we showcase a wide array of dishes to cater to every palate. The award-winning restaurant offers an exotic mix of traditional style cooking with fresh herbs and spices which are unique to every kitchen and cuisine. The interactive kitchens offer a myriad of choices including Mediterranean, Asian, Indian and Japanese dishes, all prepared à la minute. It also serves a lavish dessert spread that includes homemade desserts and ice creams from the Patisserie. Kitchen District offers its guests an exclusive dining experience with five standalone live kitchens designed to offer distinctive cuisines co-existing in perfect harmony to form a singular culinary District. Lavana is the hotel’s signature fine dining restaurant, serving authentic Awadhi, Mughlai& North Indian cuisine from the royal kitchens. The menu comprises of a variety of sumptuous vegetarian and non-vegetarian delicacies including Nihari Gosht, Shahi Galouti Kebab, Awadhi Murgh & GoshtBiryani, Dum Aloo Lucknowi and Navratan Biryani, along with delicious breads like Gilafi Kulcha and Sheermal. For a perfect finish to an exquisite meal, the menu also features mouth watering desserts, such as Shahi Tukda and Phirni. Three open tandoors, the focal point of the restaurant, add to the guest’s dining experience, where diners are welcome to interact with the chefs. 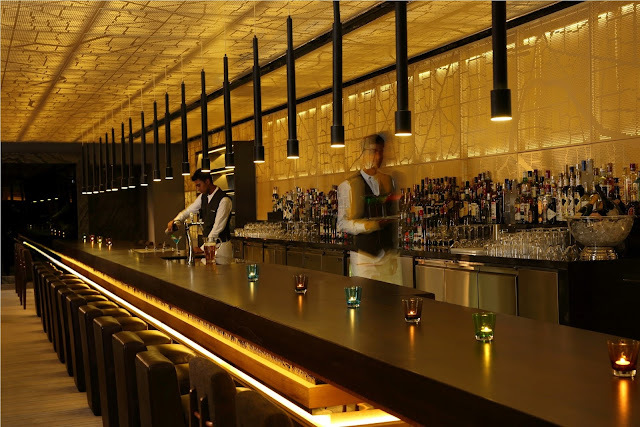 The Long Bar is the latest entrant in the Food & Beverage offerings at Hyatt Regency Gurgaon. Adjacent to the vibrant Kitchen District, the Bar houses a premium range of spirits and an eclectic selection of creative cocktails. A wide range of perfect bite-size international and local delicacies have been created to accompany each drink. At 60 Ft. long, The Long Bar is stylish and intimate. Spread across123 sq. ft, it has a counter capacity of 30 in addition to a lounge capacity of 28.The Bar also comes equipped with a Japanese ice ball maker which prepares 65mm spherical ice balls that the experienced bartenders use in their presentation. The Long Bar houses a selection of over 100 wines many of which are served by the glass.It focuses on serving premium wines and a selection of the finest cocktails prepared by skillful bartenders using the freshest ingredients available. Expert mixologists create unique and unusual cocktails. To compliment the drinks, Long Bar offers an array of appetizers. Whether you prefer a cold platter with fresh crunchy snacks, chicken or a hot spread of arancini, paninis, spring rolls and yakitori grills, the Bar menu won’t let you down.